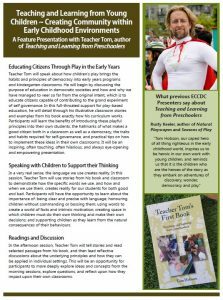 Creating Community within Early Childhood Environments: Educating Citizens Through Play in the Early Years; Speaking with Children to Support their Thinking; and Reading and Discussion around Teacher Tom's book, Teaching and Learning from Preschoolers. 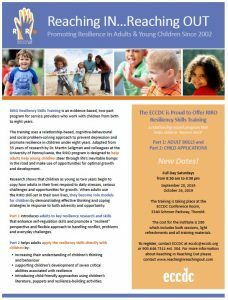 RIRO Resiliency Skills Training is an evidence-based, two-part program for service providers who work with children from birth to eight years. Research has shown that children who have emotionally available caregivers develop: secure attachments, school readiness, healthy emotional development, strong problem-solving skills, and emotional regulation. In this workshop you will gain knowledge to identify the function of behaviour, understand the importance of data collection, and develop strategies to help promote student success. This workshop will also cover Self-Regulation: What it is, why it’s important, signs of it and what we can do in child care settings to promote positive self-regulation skills.